Argentina was not the only South American country to honor us with a diplomatic visit: H.E. 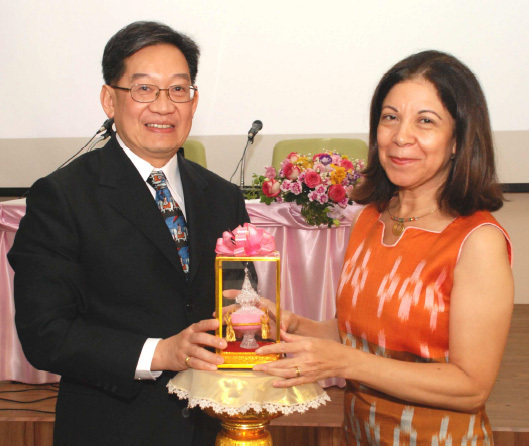 Mr. Andelfo Garcia, the Ambassador of Colombia to Thailand, came to the Faculty of Arts on November 11, 2014, and was received—naturally, given the similarities of his and Ms. Ramirez' roles—by a lineup not too different from above: Associate Professor Surapeepan Chatraporn, the Deputy Dean for International Affairs, Ajarn Dr. Pasuree Luesakul, the Director of the Latin American Studies Center, and, in addition, Khun Supariya Lulitananda, the Director of Humanity Information Center. Ambassador Garcia presented books on Colombian linguistics, history, society, and literature, and a collection of Colombian Nobel Laureate Gabriel Garcia Marquez’s works to Arts students and faculty. 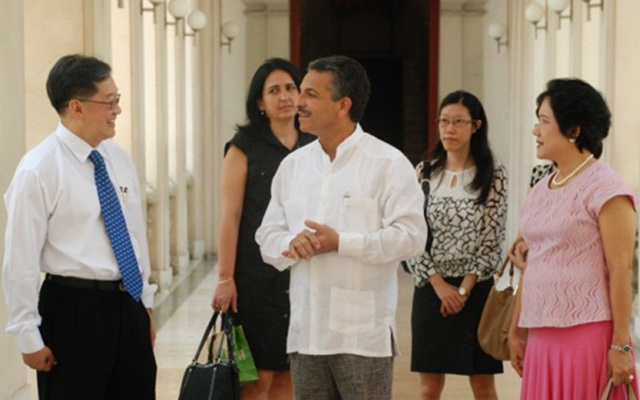 He also visited the Latin American Studies Center, and the Confucius Institute. Argentina and our Faculty have maintained good relationships for quite a while, and one further step was taken on September, 2014. H.E. 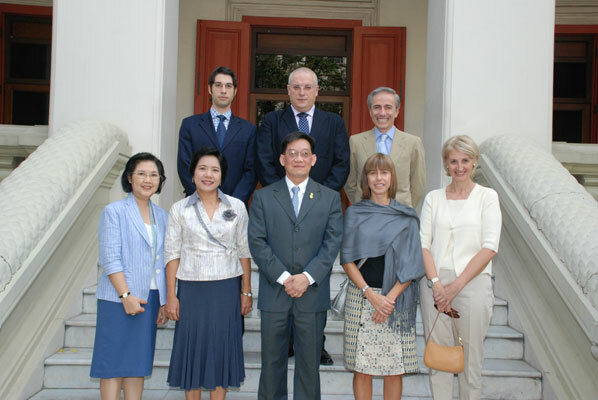 Ms. Ana Maria Ramirez, the current Ambassador of Argentina to Thailand, visited the Faculty of Arts. Warmly welcomed by Assistant Professor Dr. Prapod Assavavirulhakarn, the Dean of the Faculty, Associate Professor Surapeepan Chatraporn, the Deputy Dean for International Affairs, and Ajarn Dr. Pasuree Luesakul, the Director of the Latin American Studies Center at the Commons, Maha Chakri Sirindhorn Building, Ambassador Ramirez presented books to the Latin American Studies Center, and even observed a Spanish class attended by Arts freshmen. The Ambassador also visited the Latin American Studies Center and the Confucius Institute, and was greeted by Associate Prof. Dr. Han Shenglong, the Director. Assistant Professor Dr. Prapod hosted a lunch for the Ambassador at Water Library, Chamchuri Square. Cultural events co-hosted by the Faculty of Arts and embassies have become a treasured tradition at Chulalongkorn University by now. Austria is the latest country to cooperate with us in this way; in particular, the KAFKA Conference will be held. To prepare for this, Assist. Prof. Dr. Prapod Assavavirulhakarn, Dean of the Faculty of Arts, and Assoc. 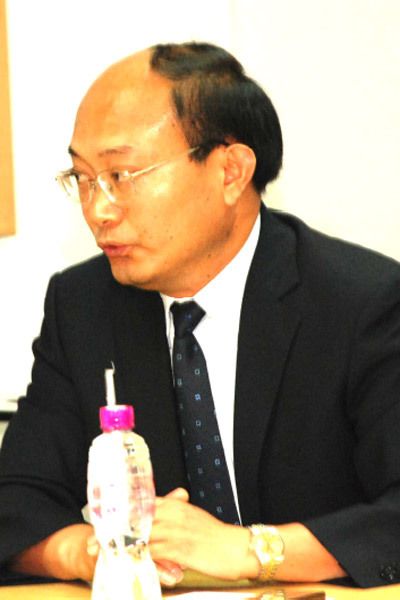 Prof. Surapeepan Chatraporn, Deputy Dean for International Affairs welcomed H.E. 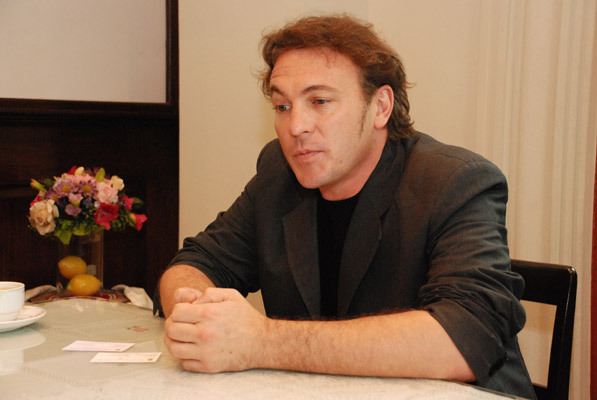 Mr. Enno Drofenik, the Austrian Ambassador, in room 814 of the Maha Chakri Sirindhorn Building on March 14, 2014. Additional representatives of the Faculty helped ensure success and highlight the importance of the meeting: Assist. Prof. Dr. Neungreudee Lohapon, Head of the Western Languages Department; Ajarn Dr.Aratee Kaewsumrit, Head of the German Department; and Prof. Thanomnuan O'charoen, also from the German Department. On the very last day of Bangkok's reign as World Book Capital - April 23, 2014 - Mexico gave both the written word and the Mexican heritage their due via a special kind of donation: H.E. 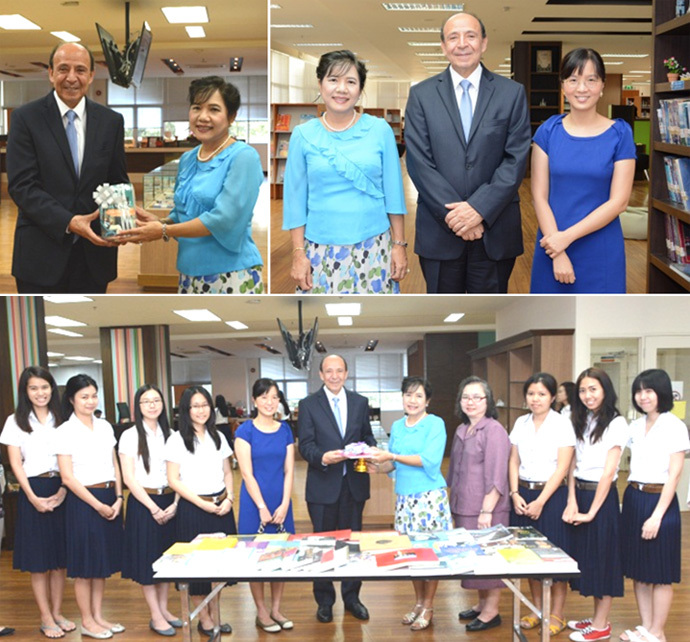 Adolfo Garcia Estrada, the Minister of Mexico to Thailand, and Mrs. Rocio Magali Maciel, the Head of the Cultural Affairs Section of the Mexican Embassy in Thailand, presented Mexican books to the Faculty of Arts. 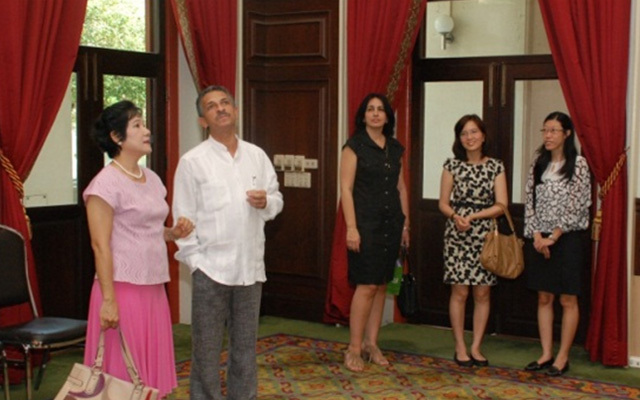 The two prominent visitors were welcomed by Assoc. Prof. Surapeepan Chatraporn, the Deputy Dean for International Affairs, Ajarn Dr. Sukij Poopuang, the Head of the Spanish Department, and Ajarn Dr. Pasuree Luesakul, the Director of the Institute of Latin American Studies. H.E. Garcia Estrada and Mrs. Rocio Magali Maciel also used the occasion for a talk to commemorate the 100th anniversary of Mexican Nobel-Prize-winning Author Octavio Paz at the Institute of Latin American Studies, Faculty of Arts. The talk received much attention from both BALAC students and as other guests. Cultural exchange and strong academic networks with Malaysia, the important neighbor to the South and partner in ASEAN, certainly need be a top priority of any university these days. And our faculty is leading the way in this regard, as evidenced by the official visit from the National University of Malaysia's School of Language Studies and Linguistics, which is part of their Faculty of Social Sciences and Humanities. On November 5, 2013, Assist. Prof. Dr. Prapod Assavavirulhakarn, the Dean of the Faculty of Arts; Assoc. Prof. Surapeepan Chatraporn, the Deputy Dean for International Affairs; and Dr. Nurida Hayiyakoh welcomed the delegation to the Learning Commons. Dean Assavavirulhakarn gave a speech and presented a token of appreciation to Prof. Sulaiman Ramli, the Head of the Malaysian Foreign Language and Translation Unit. Faculty of Arts students thereafter joined with their Malaysian counterparts in performing cultural shows about their respective countries. 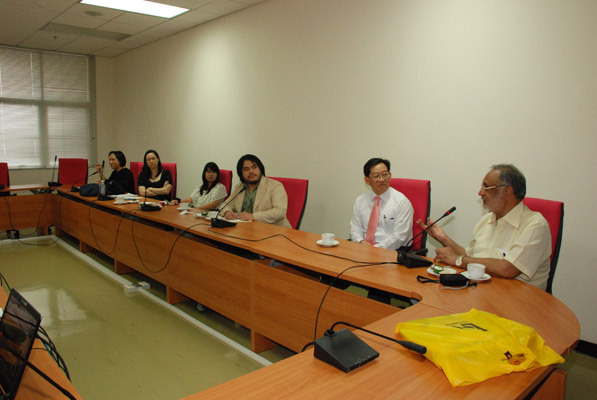 Prof. Ramli also introduced the National University of Malaysia and the Faculty of Social Sciences and Humanities to the Thai Faculty of Arts students. Following the welcoming ceremonies, students from both universities had conversations at the Learning Commons while their professors discussed possibilities for future cooperation and exchange programs in Room 814 of the Maha Chakri Sirindhorn Building. China, as a global power with tremendous regional influence on Thailand and ASEAN, is another country that our Faculty is keen on maintaining close ties with. One example of these ties is the cooperation with Fudan University, whose representatives paid a visit to us on November 14, 2013. Assist. 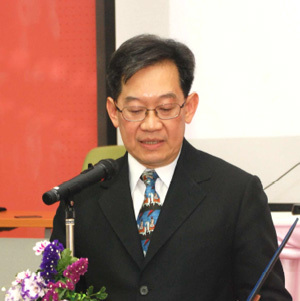 Prof. Dr. Prapod Assavavirulhakarn, Dean of the Faculty of Arts; and Assoc. Prof. Surapeepan Chatraporn, Deputy Dean for International Affairs, welcomed a team that included Dr. Jing Yijia (Associate Dean of the School of International Relations and Public Affairs), Ms. Zhu Yife (Program Officer of Asian and African Affairs) and Ms. Zhu's assistant. The meeting came with a concrete purpose: to discuss how to work together in establishing a Thai Language Center at Fudan University. The envoys also took the opportunity to make preparations for an upcoming visit by the President of Fudan University and to invite professors from the Faculty of Arts to participate in the 2014 International Conference at the Shanghai Forum. 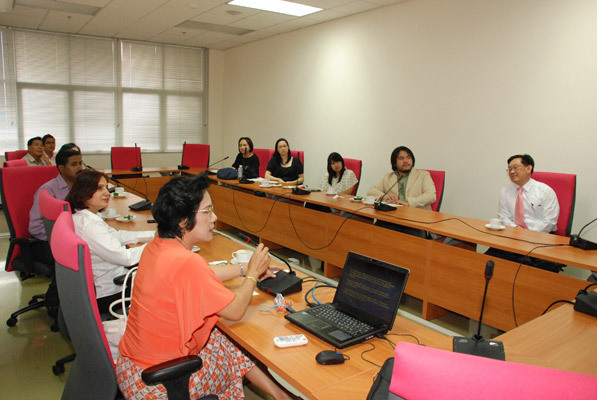 Also participating in the meeting were additional representatives of Chulalongkorn University: Assoc. 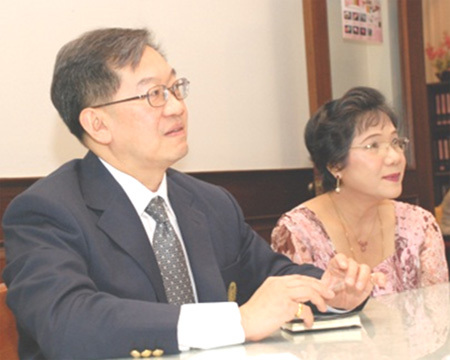 Prof. Dr. Suchitra Chongstitvatana, Director of the Institute of Thai Studies; and Prof. Dr. Siraporn Nathalang, Director of the Thai Studies Program. Any account of our strong Asian connections would be woefully incomplete without mention of Chula’s ties to Japan. 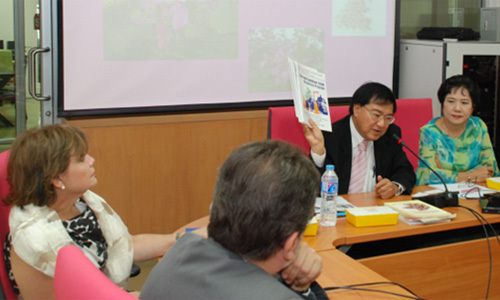 Recent examples include Soka University: At 1:30 P.M. on January 28, 2014, visitors from this institution met Prof. Pirom Kamolratanakul, M.D., the President of Chulalongkorn University, at the Reception Room of the Chamchuri 4 Building. The list of visiting dignitaries included Mr. Hiromasa Ikeda, his Advisory Board and the Vice-President. Assoc. 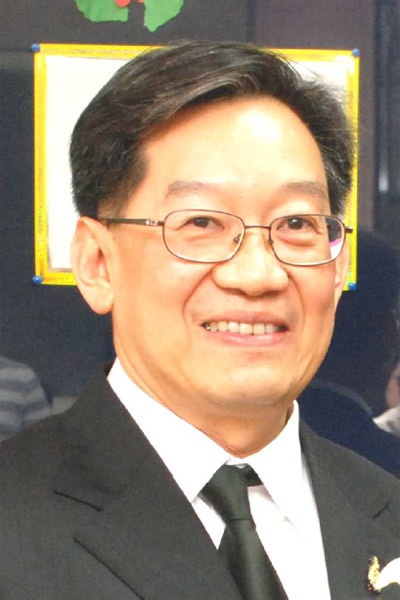 Prof.Surapeepan Chatraporn, the Deputy Dean for International Affairs, was invited to participate in the meeting in order to strengthen the academic and cultural cooperation between Chulalongkorn University and Soka University. Assistant Prof. Dr. Prapod Assavavirulhakarn, our Dean, and Associate Prof. Surapeepan Chatraporn, Deputy Dean for International Affairs, gave a very warm welcome to His Excellency Mr. Felix Denegri, Ambassador of the Republic of Peru, and Mr. Emilio Irribarren, Deputy Head of Mission, on August 8, 2013. Present to greet the Peruvian Ambassador were Ajarn Dr. Pasuree Luesakul, Director, Latin American Studies Center, and Ajarn Dr. Penpisa Srivoranart from the Spanish Section. 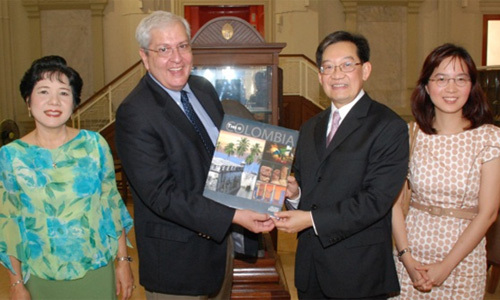 Upon his taking up a new position in Thailand, His Excellency Mr. Denegri expressed his wish to continue the goodwill between the Peruvian Embassy and the Faculty of Arts and to strengthen the ties even further by augmenting both the academic and cultural collaboration between the Embassy and the Faculty of Arts. 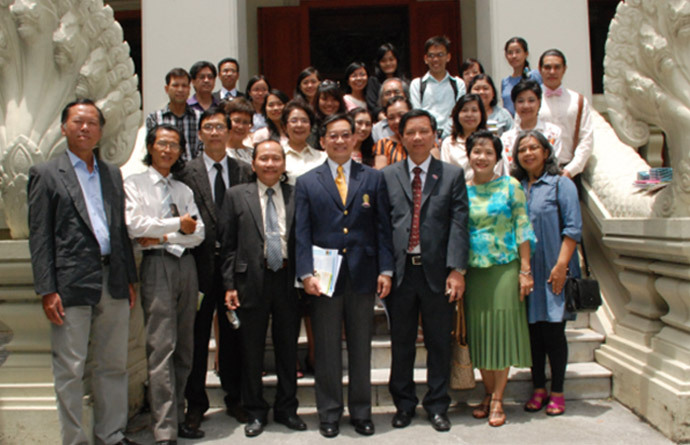 Twenty two representatives from the Faculty of Linguistics and Literature, University of Social Sciences and Humanities of Ho Chi Minh City comprising Dean, Deputy Deans, Department Heads and Center Directors paid a visit to the Faculty of Arts on August 5, 2013. Assistant Prof. Dr. Prapod Assavavirulhakarn, Dean, and Associate Prof. Surapeepan Chatraporn, Deputy Dean for International Affairs welcomed the administrators and led them to the Prof. Emeritus Suthiluk Meeting Room, Maha Chakri Sirindhorn Building. Waiting to greet the Vietnamese administrators and to have a meeting with them were Associate Prof. Dr. Nattama Pongpairoj, Deputy Dean for Research, Assistant Prof. Sunij Sutanthavibul, Deputy Dean for Academic Affairs, Associate Prof. Dr. Wirote Aroonmanakun, Head, Department of Linguistics, Assistant Prof. Dr. Chutima Prakardwuttisarn, Head, Department of Comparative Literature, Ajarn Dangkamon Na Pombejra, Head, Department of Dramatic Arts, Associate Prof. Dr. Monthira Rato, Head, Section of the Vietnamese Language, Assistant Prof. Dr. Namtip Pingkarawat, Department of English, Ajarn Dr. Pittayawat Pittayaporn, Department of Linguistics, and Associate Prof. Pornrat Damrhung, Department of Dramatic Arts. 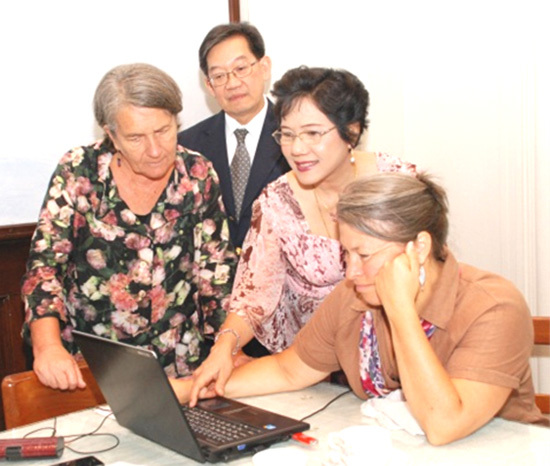 The Dean and Deputy Deans of the Faculty of Linguistics and Literature, University of Social Sciences and Humanities of Ho Chi Minh City, introduced their Faculty and University to us and Deputy Dean Surapeepan Chatraporn, in turn, gave a PowerPoint presentation of Chulalongkorn University and the Faculty of Arts to her Vietnamese colleagues. Both groups discussed ways and means to collaborate between the two institutions. 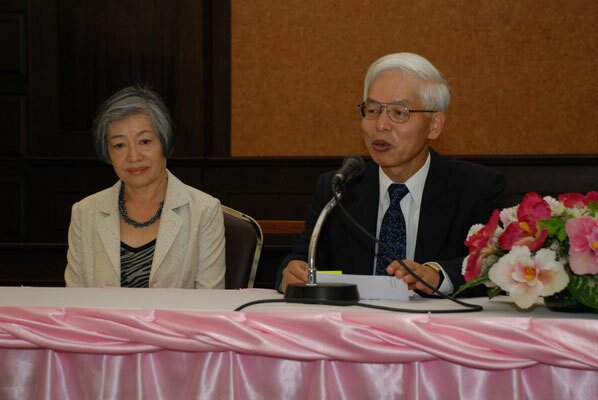 To begin the relations between the two Faculties, the Vietnamese Dean of the Faculty of Linguistics and Literature, invited Thai faculty members to participate in an international conference on “Studies on Vietnamese and Japanese Literature in the Globalization Context of the 21st Century,” which would be held in December 2013. 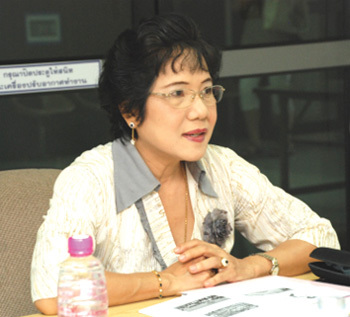 The Faculty of Linguistics and Literature would provide accommodations and meals for the Thai faculty members. Dean Dr. Prapod expressed his thanks for the generosity of his counterpart and agreed to co-host an academic event in 2014. Five representatives from Vietnam National University, Vietnam, namely, Assoc. 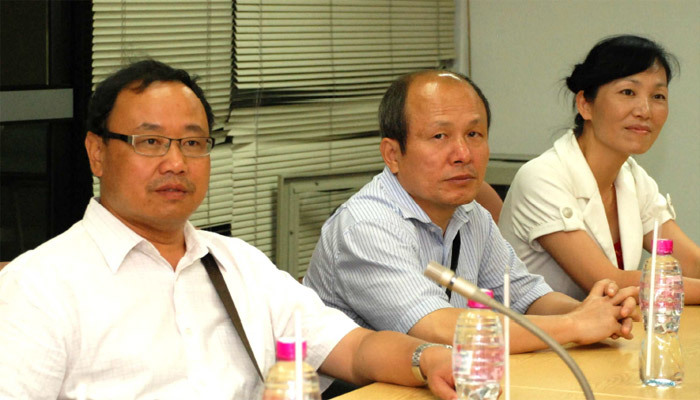 Prof. Dr. Nguyen Hieu, Deputy Dean of Faculty of Geography, Prof. Dr. Nguyen Cao Huan (Geography), Prof. Dr. Truong Quang Hai (Geography), Assoc. Prof. Nguyen Ngoc Thach (Remote Sensing and GIS) and Dr. Dinh Thi Bao Hoa (Remote Sensing and GIS, and M.Sc. of Remote Sensing and GIS in AIT) paid a visit to the Faculty of Arts on July 10, 2013. Waiting to welcome them in Room 705, Boromrajakumari Building were Associate Prof. Surapeepan Chatraporn, Deputy Dean for International Affairs, Assistant Prof. Dr. Sirivilai Teerarojanarat, Head, Department of Geography, Assistant Prof. Dr. Pannee Cheewinsiriwat, Ajarn Dr. Thitirat Panbamrungkij, Ajarn Areerut Patnukao, and Ajarn Puttaporn Areeprachakun, all from the Department of Geography. The representatives from Vietnam National University introduced the curriculum of the Faculty of Geography to us and the Head of the Geography Department, in turn, gave details about the teaching and learning at our department. The representatives from Vietnam National University expressed their desire to cooperate with the Department of Geography at our Faculty of Arts, in terms of student and faculty exchange, study trip programs, as well as research and seminar projects for both students and faculty. After a long discussion, Chulalongkorn’s Department of Geography agreed to get the cooperation started by drafting the MOU between the two institutions and making a plan for a study trip to the Faculty of Geography, Vietnam National University. ASEAN is certainly on everybody’s minds, and so is online education. 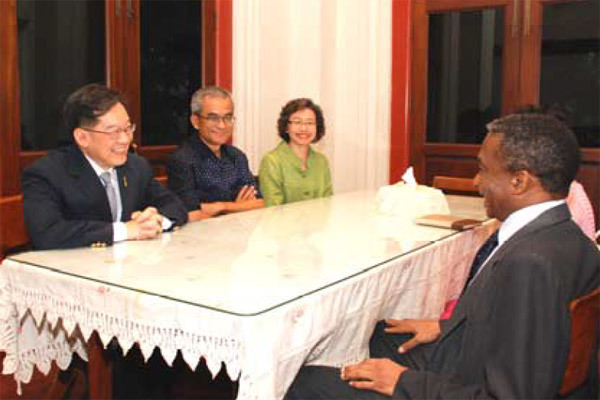 On July 8, 2013, both topics were combined on the agenda when Assistant Prof. Dr. Prapod Assavavirulhakarn, Dean, and Associate Prof. Surapeepan Chatraporn, Deputy Dean for International Affairs, welcomed Professor Dr. Kwon Goosoon, the Director General of the Secretariat of the ACU Project, Department of General Education and Dr. Park Sohwa, the Deputy Director General of the Secretariat of the ACU Project at Seoul Cyber University, South Korea. The purpose of the visit of the representatives was to request cooperation from Chulalongkorn University to participate in the establishment of ASEAN Cyber University (ACU) under the leadership of Seoul Cyber University. Present at the meeting were Assistant Prof. Dr. M.R. Kalaya Thingsabadh, Vice President for Academic Affairs, Associate Prof. Dr. Sunait Chutinatharanon, Director, Institute of Asian Studies, Prof. Dr. Siraporn Nathalang, Director, Thai Studies Program, Assistant Prof. Dr. Paniti Hoonswaeng, Director, Sirindhorn Thai Language Institute, and Assistant Prof. Sunij Sutanthavibul, Deputy Dean for Academic Affairs, Faculty of Arts. After a long and thorough discussion, Vice President Dr. M.R. Kalaya Thingsabadh concluded that Chulalongkorn University had a unit with an expertise in this field and we already had a plan to develop this area on our own. They visited us in order to learn of the Faculty of Arts and its academic mission and to explore the feasibility of collaboration in various aspects. Present at the meeting were Associate Prof. Dr. Sunait Chutinatharanon, Director, Institute of Asian Studies, Prof. Dr. Siraporn Nathalang, Director, Thai Studies Program, Ajarn Dr. Pasuree Luesakul, Director, Latin American Studies Center, and Ajarn Dr. Nunghatai Rangponsumrit, Head of the Spanish Section. After the meeting, Dean Dr. Prapod and Deputy Dean Surapeepan Chatraporn took the Latin American administrators to meet with Prof. Pirom Kamolratanakul, M.D., President of Chulalongkorn University, and Assistant Prof. Dr. Kriengkrai Boonlert-U-Thai, Assistant to the President and Acting Director of the Office of the International Affairs, at the Reception Room in Chamchuri 4 Building. After the discussion and negotiation, President Pirom hosted lunch for the Latin American administrators at Sasa Restaurant on campus. It would not be an overstatement to call Dr. Tomasz Gerlach the face of Poland at our Faculty: A very good friend of Arts at Chula, he arranged three cultural activities between the Embassy of the Republic of Poland and us and participated in various activities held by the Faculty in cooperation with Embassies of European countries. 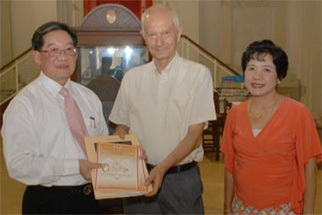 On June 18, 2013, Dr. Gerlach, First Consultant of the Polish Embassy, came to bid farewell to the Dean as he would be completing his term in Thailand and return to Poland for a newly assigned position. Assistant Prof. Dr. Prapod Assavavirulhakarn, Dean, and Associate Prof. Surapeepan Chatraporn, Deputy Dean for International Affairs, expressed their gratitude and appreciation to Dr. Gerlach for his dedicated work and his close ties with our Faculty for four consecutive years. On this occasion Dean Dr. Prapod presented him with a plaque of friendship. Inscribed on the plaque were words of thanks and cordial friendship. Afterwards Dean Dr. Prapod hosted a farewell lunch for Dr. Tomasz Gerlach at Khrua Dok Mai Khao Restaurant. On March 22, 2013, His Excellency Mr. Victor Daniel Ramirez Peña, Ambassador of the Republic of Cuba, together with his wife, paid a courtesy visit to Assistant Prof. Dr. Prapod Assavavirulhakarn, Dean, on the occasion of his taking up the post in Thailand. Joining to welcome His Excellency and his wife were Associate Prof. Surapeepan Chatraporn, Deputy Dean for International Affairs, Ajarn Dr. Nunghatai Rangponsumrit and Ajarn Dr. Pasuree Luesakul, both from the Spanish Section at the Department of Western Languages. 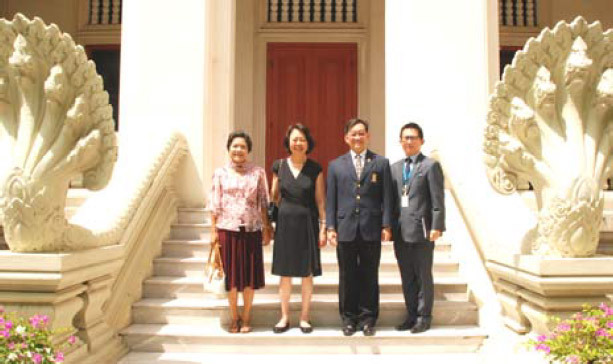 To introduce the Ambassador and his wife to the history and architecture of the University, the Dean and the faculty members took the Ambassador and his wife on a tour of the Maha Chulalongkorn Building. 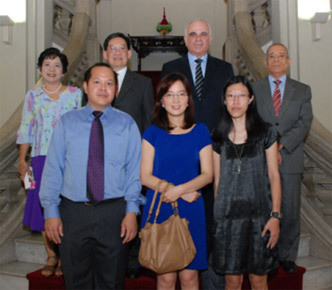 The Ambassador showed a keen interest in both the historical details and the architectural design of the building, pointing out that the beauty and the exquisite architectural design of the Maha Chulalongkorn Building reminded him of the architecture of the landmark building of a famous university in Cuba. The Dean also took the Ambassador and his wife to visit the main hall of Maha Vajiravudh Building which had just been renovated and redecorated to be a reading room. In this main hall, with the replica of the stone inscription in the background, the Dean presented a token of friendship to the Ambassador. After the tour of the Faculty, the Dean hosted lunch for the Ambassador and his wife at the Crystal Jade restaurant, Siam Paragon. The Faculty is strengthening its ties with New Zealand as well: Recently, our Dean, Assistant Prof. Dr. Prapod Assavavirulhakarn, and Associate Prof. Surapeepan Chatraporn, Deputy Dean for International Affairs, gave a warm welcome to visitors from Auckland University of Technology (AUT). Prof. Dr. Sharon Harvey, Deputy Dean (Research), School of Language and Culture, Faculty of Culture and Society, and Prof. Linda O’Neill, Deputy Dean, School of Hospitality and Tourism, Faculty of Culture and Society were here on March 1, 2013 to establish relations with the Faculty of Arts, Chulalongkorn University and to discuss plans for educational exhibitions at both universities next year. Prof. Harvey gave a PowerPoint presentation introducing the School of Language and Culture and the School of Hospitality and Tourism, Faculty of Culture and Society, followed by a PowerPoint presentation introducing our Faculty of Arts by Associate Prof. Surapeepan Chatraporn. The two representatives from AUT presented drafts of a Memorandum of Understanding and action plans for activities to Dean Dr. Prapod. They would email more details and documents to the Faculty of Arts for further consideration upon their arrival at Auckland University of Technology. Argentina and our Faculty have had very friendly ties for a while, and many of our former and present students will remember Argentinian events fondly. Thus, it was both pleasant and logical to continue the tradition: On February 15, 2013 H.E. 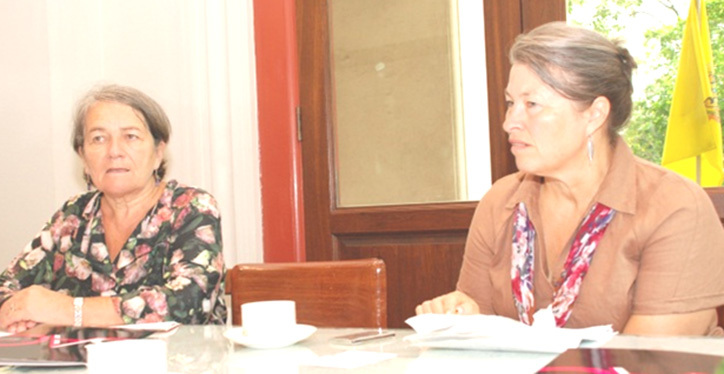 Ana Maria Ramirez, the current Ambassador, paid a courtesy visit to the Faculty of Arts to discuss the feasibility of further collaboration between our Faculty and the Argentinian Embassy, and to strengthen the exisiting ties between the two institutions. Assistant Professor Dr. Prapod Assavavirulhakarn gave a welcome speech to the Ambassador and presented her with a token of friendship. Present at the ceremony were Associate Professor Surapeepan Chatraporn, Deputy Dean for International Affairs, Ajarn Dr. Nunghatai Rangponsumrit, Head of the Spanish Section, Ajarn Dr. Pasuree Luesakul, and Ajarn Dr. Penpisa Srivoranart, both from the Spanish Section. To mark the occasion, H.E. Ana Maria Ramirez together with Dean Dr. Prapod Assavavirulhakarn presided over a special talk on "A Socio-Cultural Perspective on Thai-Argentina Relations" delivered by Prof. Ezequiel Ramoneda, a researcher from Argentina. 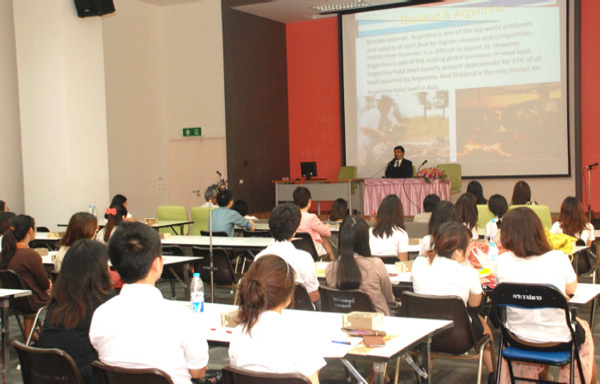 The lecture, co-organized by the Latin American Studies Center and the Section of International Affairs, took place in Room 304, Maha Chakri Sirindhorn Building from 10 to 12 a.m. A good number of students and faculty members attended the special lecture. After the talk Dean Dr. Prapod hosted a lunch in honor of H.E. Ana Maria Ramirez at the Crystal Jade Restaurant. 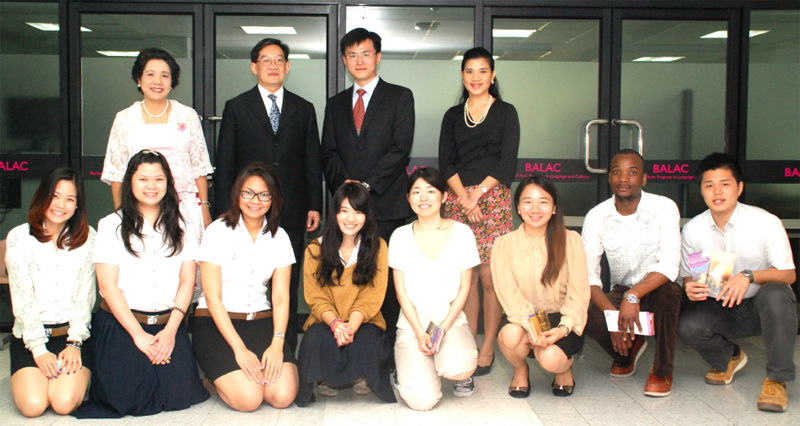 On February 7, 2013, Assistant Professor Dr. Prapod Assavavirulhakarn, the Dean, Associate Professor Surapeepan Chatraporn, the Deputy Dean for International Affairs, and Assistant Professor Dr. Duantem Krisdathanont, the BALAC Deputy Director, together with selected BALAC students welcomed Professor Dr. Min Zhu and a group of students from the School of International Relations at Japan's prestigious Waseda University. The purpose of the visit was to establish relations between our own Bachelor of Arts in Language and Culture Program (BALAC) and the School of International Relations at Waseda University and to participate in a mini-seminar on, appropriately, "Multiculturalism in Asia." The mini-seminar took place in Room 708, Borom Rajkumari Building, from 9 to 12 a.m. and was followed by lunch -- hosted by the Dean -- for faculty members and students of both programs. To Guangdong University, our Faculty of Arts is a highly esteemed destination -- after all, when an administrative team from the Chinese institution visited on September 27, 2012, the delegation consisted of a whole range of top staff: the Vice president, Prof. Yong Heming, Prof. Li Huanrong, Director of the MBA Center, Prof. Hong Yong, the Dean of the School of Mathematics and Computer Technology, Prof. Lai Qing, and Mr. He Xiongwei, Deputy Directors of the School of Information Technology and the Human Resources Department, respectively, and Ms. Yang Chun, Head of the Section of International Affairs. 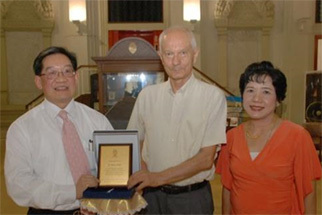 To do this justice, Guangdong University's administrative team was welcomed by an equally distinguished group from the Faculty of Arts, namely Associate Professor Surapeepan Chatraporn, Deputy Dean for International Affairs, Ajarn Dr. Chanyaporn Parinyawuthichai, Head, Section of the Chinese Language, Ajarn Dr. Hathai Jia, and Assistant Professor Dr. Suree Chunharuangdej. Needless to say, the exchange focused on the specific characteristics of both institutions and the opportunities that follow from there, especially in terms of Chinese studies. 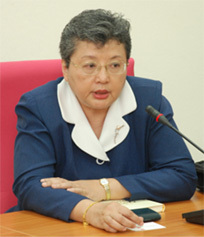 In her welcome address, Associate Professor Surapeepan Chatraporn, to lay the groundwork, combined an overview of the Faculty's history with an introduction to the administrative structure. Prof. Yong Heming, Vice President of Guangdong University, in turn explained the various schools of Guangdong University, as well as their particular areas of expertise and specialization. Chula's Chinese Language Section with its curriculum was illustrated in detail as well, by its faculty members, all of which led to discussion about definite possibilities and benefits of future collaboration and exchange. Assistant Professor Dr. Prapod Assavavirulhakarn, our Dean, and Associate Professor Dr. Prapin Manomaivibool, the founder of the Section of Chinese Language and also the Director of the Asia Research Center, hosted a lunch for the Administrative Team from Guangdong University and the faculty members of the Faculty of Arts at the Montien Hotel, where the Dean and the Director presented tokens of friendship to their Chinese counterparts. Dr. Edward S. Inch, the Dean of the College of Arts and Letters, and Dr. Guido Krickx, the Dean of the College of Continuing Education at California State University, Sacramento, paid a courtesy visit to the Faculty of Arts on July 23, 2012, the importance of which is highlighted by the array of our professors welcoming them: Assistant Professor Dr. Prapod Assavavirulhakarn, Dean, Associate Professor Surapeepan Chatraporn, Deputy Dean for International Affairs, Professor Dr. Siraporn Na Thalang, Chairperson of the Thai Studies Program, Associate Professor Dr. Sujitra Jongsatitwatana, Director of the Thai Studies Institute, and Associate Professor Dr. Supakorn Disthapantu, Dean, Faculty of Fine and Applied Arts, treated the two Deans from California's capital to detailed information on different fields of study at the Faculty of Arts as well as at the Faculty of Fine and Applied Arts. Needless to say, the visit served to explore and forge links between the two Colleges of CSUS, and us and to explore the feasibility of concrete collaboration between Chulalongkorn University and "Sac State", one of the largest universities in California (and alma mater of Tom Hanks). The Learning Commons at the new Maha Chakri Sirindhorn Building is not only a big hit with our students—now, its reputation has spread to China as well. 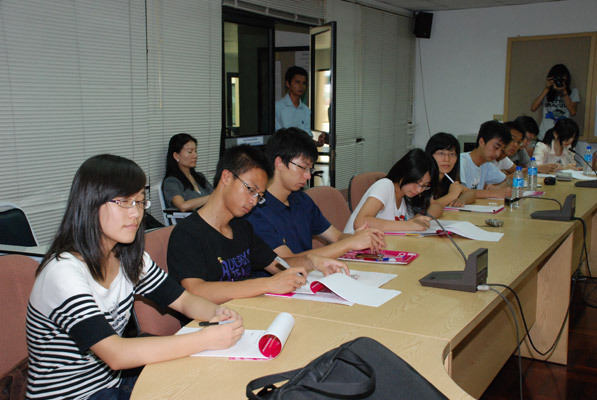 On July 25, 2012, 25 students of Zhejiang University, together with Prof. Zuoxiang Zhu, Director of the university's Work-Study Entrepreneurship Education Office, visited our Faculty, and the Learning Commons in particular. Welcomed by Associate Professor Surapeepan Chatraporn, Deputy Dean for International Affairs, the guests learned about the history and development of the Faculty as well as about our Thai and International programs, before Ms. Yupin Chancharoensin, Director of Humanities Information Center, enthusiastically introduced the group to the system of the Faculty's library and its state-of-the-art equipment. The students were very impressed, not only with the high technology but also with the modern and comfortable ambience of the Learning Commons where students can both relax and study. 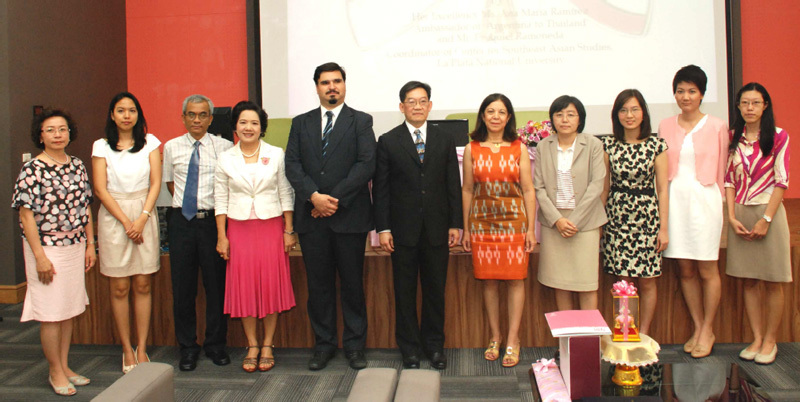 The next day, Prof. Fu, the Chinese Director of the Confucius Institute, gave a lecture on the Confucius Institute in Thailand and the relations between Thailand and the Republic of China. 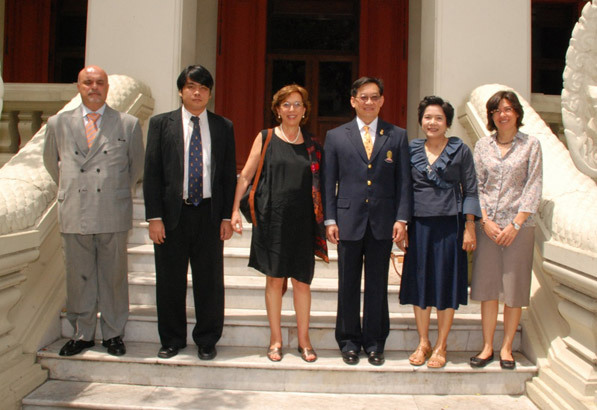 A recognizable part of our more recent history has been the Cuban Ambassador to Thailand, H.E. 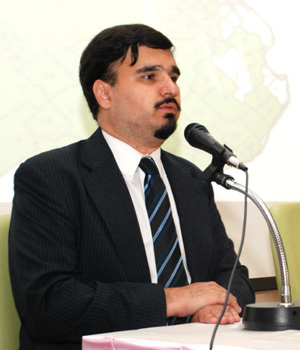 Lazaro Herrera. 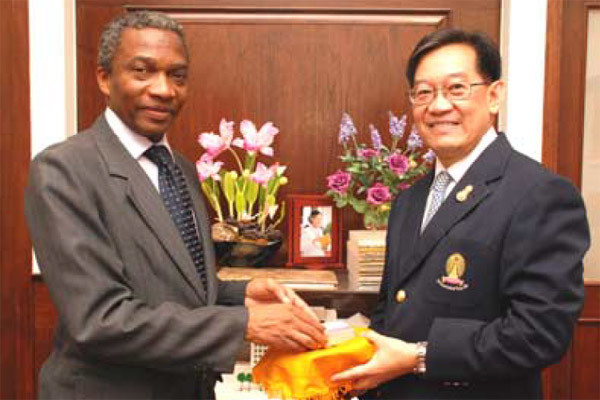 His Excellency has been a known friend of the Faculty and many of its members ever since he visited four years ago, when his appointment in Bangkok began. Now that his time in Thailand is coming to a close, he paid a farewell visit to Assistant Professor Dr. Prapod Assavirulhakarn, Dean of the Faculty of Arts. Also on hand were Associate Professor Surapeepan Chatraporn, Deputy Dean for International Affairs, Ajarn Chantra Pramoonsab, Head of the Spanish Language Section, and Associate Professor Dr. Sathaporn Tippayasak. 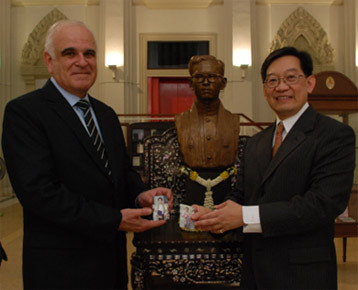 Dean Prapod presented Ambassador Herrera with souvenirs from the Maha Chakri Sirindhorn Foundation, and the Ambassador left the Faculty a farewell message in the visitors' book. The city state of Singapore might be known primarily for commerce and technology, but H.E. 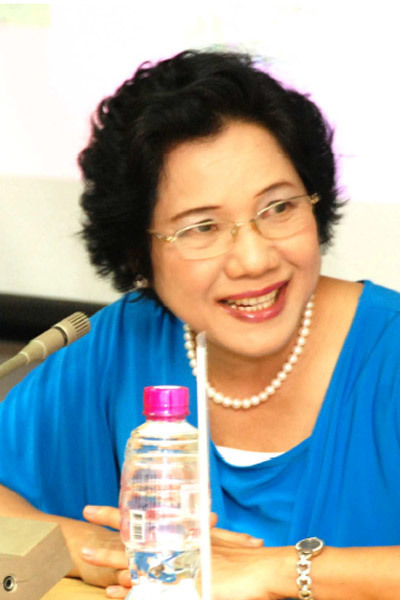 Chua Siew San, the Singaporean Ambassador to Thailand, takes the Arts very seriously: On Thursday, 31 May 2012, H.E. Chua Siew San, together with her political consultant, Mr. Harry Goh, paid a visit to our Faculty. They were welcomed by Assistant Professor Dr. Prapod Assavirulhakarn, Dean of the Faculty of Arts, and Associate Professor Surapeepan Chatraporn, Deputy Dean for International Affairs. "History" could have been the unofficial motto of the diplomats' visit, as Dean Prapod gave them an overview of the Faculty's momentous past and a tour of the Maha Chulalongkorn Building, an essential part of said past and the place where classes were held in former times. Closer to home, but certainly no less important for Thai academic relations is Indonesia; and the Faculty's international cooperation takes this country very seriously indeed: On 27 January 2012, Assistant Professor Dr. Safrina Noorman and Dian Dia-an from the English Education Department, Universitas Pendidikan, Indonesia, paid a visit to the Faculty of Arts and were welcomed by Associate Professor Surapeepan Chatraporn, Deputy Dean for International Affairs and Assistant Professor Nattama Pongpairoj, Head of the Department of English. In addition to exchanging views about teaching and research, the visitors were here seeking suggestions for curriculum development and improvement of Pendidikan's newly established program in English and Linguistic Studies. The rise of Turkey has been one of the big global stories in recent years. Our Faculty has been one of the first bodies to react to the opportunities this offers, and to join hands with colleagues and institutions in this fascinating nation. 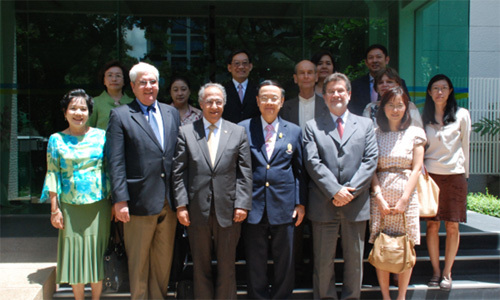 On 24 January 2012, Professor Erkan Kirbiyik from Suleyman Demirel University in Turkey and Mr. Zeki Parilti, the Thai-Turkish Business Association's Cultural Director, paid a visit to the Faculty of Arts to seek academic collaboration between Suleyman Demirel University and Chulalongkorn University via a Memorandum of Understanding (MOU). They were welcomed by the Faculty's Dean, Assistant Professor Dr. Prapod Assavavirulhakarn, and Associate Professor Surapeepan Chatraporn, Deputy Dean for International Affairs. 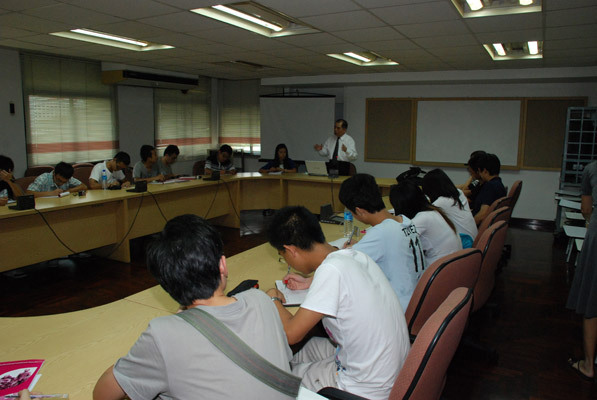 Professor Shen Ivming, Deputy Director, Quality Development Officer, and lecturer, took 25 students from Zhejiang University to visit the Faculty of Arts on July 27, 2011. The group was cordially welcomed by Assistant Professor Dr. Prapod Assavavirulhakarn, Dean, Faculty of Arts and Associate Professor Surapeepan Chatraporn, Deputy Dean for International Affairs. Professor Fu, Chinese Director, Confucius Institute at Chulalongkorn University, gave a brief introduction of the Confucius Institute, followed by a talk on the long relations between the Chinese and the Thai people. After the lecture Zhejiang students were given a wonderful opportunity to meet, talk and socialize with Arts students majoring in Chinese. The students from the two universities exchanged ideas and attitudes in a friendly and enjoyable manner. Zhejiang University, established in 1897, is one of the leading and oldest universities of the Republic of China. The University is situated in Hangzhou near Xihu Lake. It has a student population of 45,000, 1,700 of whom are foreign students. The University comprises altogether 26 schools and has six affiliated hospitals. Assistant Professor Dr. Prapod Assavavirulhakarn, Dean, Faculty of Arts, gave a welcoming speech and Associate Professor Surapeepan Chatraporn, Deputy Dean for International Affairs, gave an overview of the Faculty of Arts. In turn, Professor Harjit Singh gave an introduction of Jawaharlal Nehru University followed by his colleagues giving short information on their respective offices. Arts Faculty members who participated in this meeting, contributed ideas concerning cooperation, and exchanged opinions with the Indian counterparts were as follows : Asstant Professor Dr. Trisilpa Boonkhachorn, Head of Department of Comparative Literature, Assistant Professor Lieutenant Dr. Banjob Bannaruji, Department of Eastern Languages, Assistant Professor Dr. Sirivilai Teerarojanarat, Head of Department of Geography, Ajarn Dr. Bhawan Ruangsilp, Department of History and Ajarn Dr. Charnwit Tadkeaw also from the Department of Eastern Languages. Assistant Professor Dr. Prapod Assavavirulhakarn, Dean, Faculty of Arts and Associate Professor Surapeepan Chatraporn, Deputy Dean for International Affairs gave a warm welcome to Professor Dr. Paul Mountfort, Chairman, Center for Creative Writing and B.A. English Studies from the Faculty of Applied Humanities, Auckland University of Technology (AUT), New Zealand. Professor Dr. Paul Mountfort expressed his keen interest in setting up student exchange program with the Faculty of Arts and would discuss this feasibility together with an action plan with his University administrators as well as his colleagues upon his return to New Zealand. On May 12, 2011. Professor Dinah Azevedo Neves, the Vice President of Instituto Camoes Portugal, Mr. José Carlos Serafino, Counsellor at the Embassy of Portugal, and Ms. Luisa Dutra, Director of the Portuguese Cultural Center, paid a courtesy visit to Assistant Professor Dr. Prapod Assavavirulhakarn, Dean of the Faculty of Arts. On this occasion Associate Professor Surapeepan Chatraporn, Deputy Dean for International Affairs, together with Ajarn Dr.Piriyadit Manit, the Coordinator of Portuguese courses, gave the visitors a warm welcome. The purpose of the visit was to follow up on the implementation of Portuguese courses as a minor for Arts students and to discuss the preparation for the Portuguese Language and Culture Week to be held at the Faculty of Arts. The event is planned to take place in mid November. There will be an exhibition, a book, magazine and CD display, a movie screening as well as a reception featuring Portuguese food and dessert. 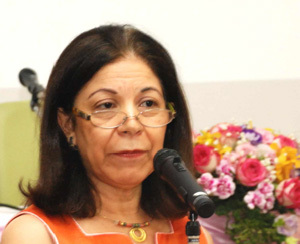 The Portuguese Language and Culture Week will be held in connection with an international conference on Portugal coorganized by the Embassy of Portugal and the European Studies Center of Chulalongkorn University. On March 15, 2011 Ajarn Dr. Julispong Chularatana invited Mr. Jalal Tamleh, Cultural Counsellor, Embassy of the Islamic Republic of Iran, to pay a courtesy visit to the Faculty of Arts. 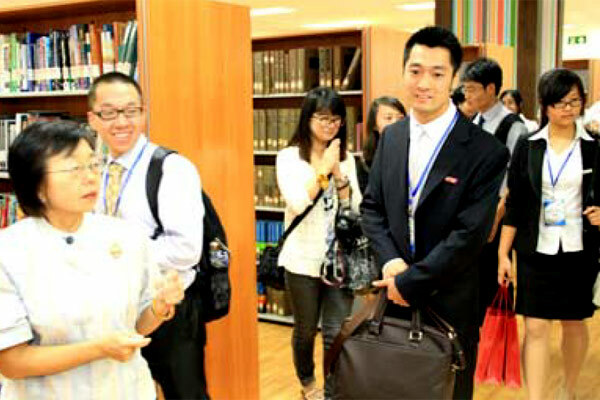 The visitors were warmly welcomed by Associate Professor Surapeepan Chatraporn, Deputy Dean for International Affairs. The discussion about the possibilities of academic and cultural collaboration was fruitful. The Embassy of the Islamic Republic of Iran expressed willingness to provide sufficient funding for the arrangement of all envisaged academic and cultural activities. These activities are aimed to enhance the cordial relations between Thailand and the Islamic Republic of Iran as well as to disseminate information on Iranian culture and people. Ajarn Dr. Julispong Chularatana will be responsible for writing proposals for budget approval and will act as a coordinator in designing activity plans. As a follow-up to the visit by H.E. James Wise to the Faculty of Arts in late January 2010, the Australian Ambassador sent his representatives to discuss the possibilities of co-organizing academic activities with the Faculty. 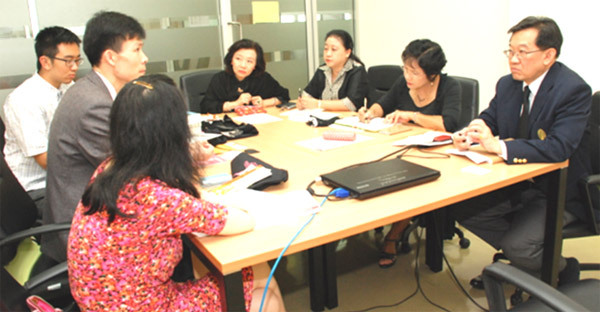 On February 3, 2011, Ms. Natalie Lastary Dewi Lee, Academic Regional Coordinator, Macquarie University, Miss Busarin Sinthunavarat, Development Manager of Education and Training, and Miss Watinee Kharnwong, Deputy Director of Education, Australian Government, paid a visit to the Faculty and met with Assistant Professor Dr.Prapod Assavavirulhakarn, Dean, and Associate Professor Surapeepan Chatraporn, Deputy Dean for International Affairs, to discuss plans for academic cooperation and dissemination of information on available Australian scholarships for Arts students. 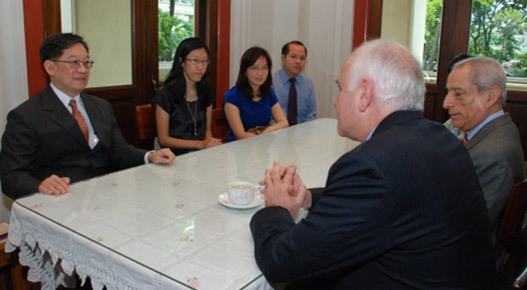 It was agreed that both institutions will co-host “A Study in Australia Week for Arts students” in November 2011. The event will comprise an exhibition at the Learning Commons in Maha Chakri Sirindhon Building, special lectures on scholarships, study plans, and life in Australia by invited professors from Australia, Thai alumni, and officers from the top ten Australian universities, as well as other related activities. Australian Ambassador H.E. 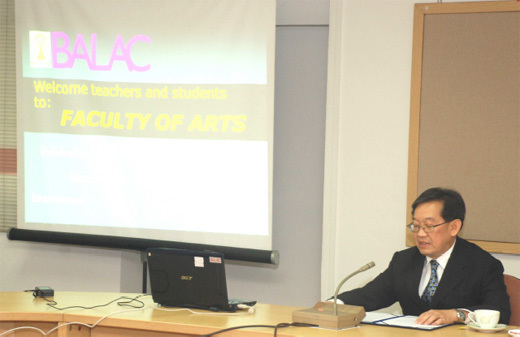 James Wise paid a courtesy visit to the Faculty of Arts on Friday January 28, 2011. Upon arrival His Excellency was given a warm welcome by Assistant Professor Dr.Prapod Assavavirulhakarn, Dean, Associate Professor Surapeepan Chatraporn, Deputy Dean for International Affairs, Assistant Professor Sunij Sutanthavibul, Deputy Dean for Academic Affairs, and Ms.Yupin Chanchareonsin, Director of Humanities Information Center. The Dean courteously escorted the Ambassador on a tour of the Maha Chulalongkorn Building and gave a detailed explanation about the history and importance of the Building. While touring the building, H.E. James Wise was warmly greeted by Nun Vimuttiya (Associate Professor Supaphan Na Bangchang, Ph.D.), Head of the International Tipitaka Hall, who invited H.E. to step into the Hall and viewed the precious books, records and digital materials concerning the Tipitaka. Nun Vimuttiya gave a briefing of the Hall and detailed the related major Buddhist activities and classes conducted there. Then H.E. James Wise was led to Room 105 where he met with Arts students from both the regular and international programs. The Ambassador gave a short talk on the requested topic “Scholarships and Study in Australia” to the students who are interested in the possibilities of furthering their studies in Australia. 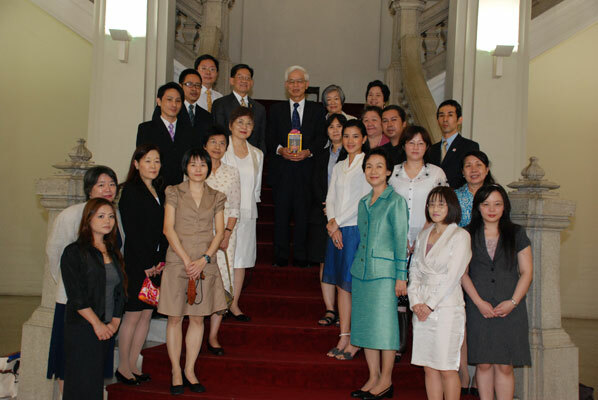 In the morning of Friday, February 12, 2010, the Faculty of Arts was honored by a visit from the Japanese Ambassador, His Excellency Kyoji Komachi, and his wife. 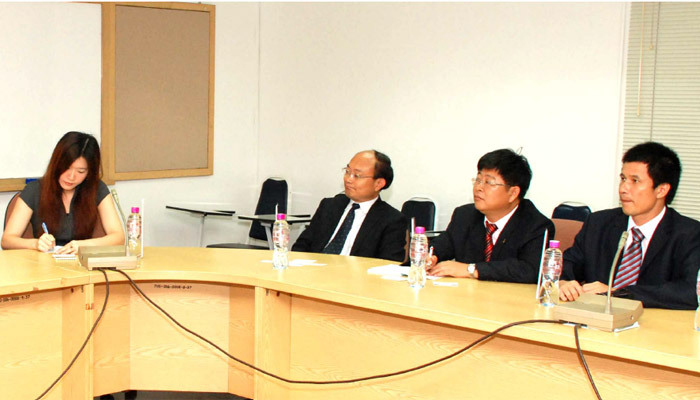 The dignitaries had been invited by the Dean, Assistant Professor Dr.Prapod Assavavirulhakarn, the Section of International Affairs under Associate Professor Surapeepan Chatraporn, and the Japanese Section of the Department of Eastern Languages. The exuberant session ended impressively with the students seeing the Ambassador and his wife off by singing the Faculty of Arts’ song, March Aksorn, making the visit memorable to all who were present. Although this Japan-themed gathering was short, only about an hour, it is clear that the memory of it, peppered with smiles and laughter, will linger on well for a long time. 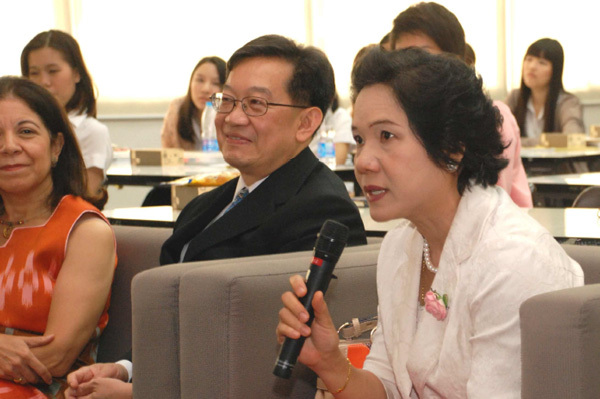 In a much anticipated visit, His Excellency Mr. Guan Mu, the Chinese Ambassador to Thailand, together with his Cultural Attaches, electrified a crowd of more than 150 faculty members, undergraduate and graduate students at Chulalongkorn University on February 2, 2010. The Ambassador’s face lit up with smiles as he walked the line of students majoring and minoring in Chinese from both Thai and International programs. The day began with informal discussions between H.E. Mr. Guan Mu, Faculty administrators, and faculty members from the Chinese Section, the Confucius Institute Director and staff.The Ambassador praised the Faculty for the high standards it has employed over the years and looked forward to continuing achievements between the two partners. and graduate students gathered in the Maha Chulalongkorn Building showed their appreciation by not only giving him a friendly welcome and listening attentively, but also by engaging him in precisely the lively discussion he had been asking for. 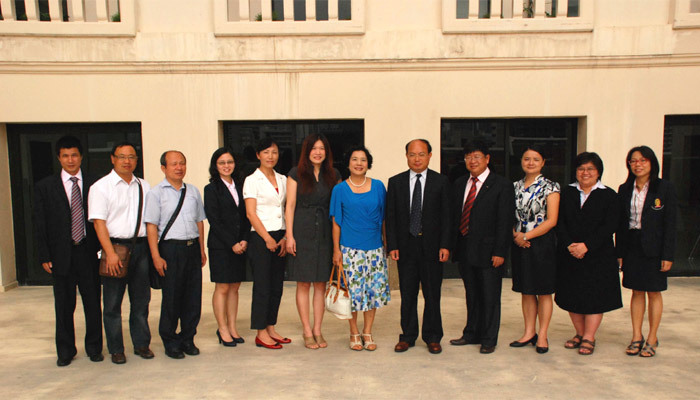 On December 1, 2009 the Faculty had an opportunity to receive another delegation from Communication University of China, headed by Professor Dr. Fan Zhou, Dean, Institute for Cultural Studies. It was agreed upon in the meeting that the Faculty will join hands with the Institute for Cultural Studies in organizing an international conference on cultural studies in the year 2011. Preparations and arrangement for the international conference will be discussed in the next meeting. observed the teaching and learning of a Spanish class and took great delight in participating in class activities with our Spanish majors. exchange and to pinpoint specific details in the forthcoming MOU between the Faculty of Arts and the College of Foreign Languages. Planning and Development. In the course of warm and productive discussions, proposals were raised to explore the possibility of formal academic and cultural cooperation between Kobe University and Chulalongkorn University. On July 22, 2009 the U.S. Embassy invited representatives from the Faculty of Arts to attend a special interview with Her Excellency Hillary Clinton on the topic of “U.S. Foreign Policy and Thai–U.S. Relations” held at Phaya Thai Palace. Associate Professor Surapeepan Chatraporn, Ajarn Dr. Sasiporn Petcharpiruch, and Ajarn Dr. Mattanee Palungtepin together with 10 student representatives participated in this event. During the Q&A session from the floor, approximately 50 questions were submitted but only 2 questions were to be selected by the Secretary of State. To our delight, a question from one of our students, Ms. Kanokrat Namasondhi was chosen. H.E. Clinton commented that she thought it “a wonderful question!” before responding in careful detail. Kanokrat was overjoyed at the opportunity to exchange words with H.E. Clinton. “I was deeply pleased and honored to be one of the student representatives to participate in the taped interview with the Secretary of State by Suthichai Yoon. To be the only student selected to ask H.E. Hillary Clinton about U.S. foreign policy and Thai Education was not only a once-in-a lifetime experience but also a memorable and precious moment for me.” “I owe a debt of gratitude to the Faculty of Arts for deepening my outlook on life and widening my worldview,” Kanokrat reflected with a proud smile. anokrat Namasondhi is currently the President of Arts senior students. She was also elected President of Arts junior students in 2008 and was a former recipient of a SEASREP (Southeast Asian Studies Regional Exchange Program) scholarship. She was recently named ‘distinguished undergraduate student’ of the Faculty of Arts for 2009. Associate Professor Dr. Yoshikawa and Professor Yuko Takeshi from Toyo Eiwa University, Japan, paid a courtesy call to the Faculty and met with Associate Professor Surapeepan Chatraporn, Deputy Dean for International affairs, on July 16, 2009 to discuss further academic cooperation and student exchange which will hopefully be implemented in the next academic year in accordance with our ongoing partnership. Associate Professor Dr.Park Jong Woo, Head, International Study Center, Professor Ikuko Seguchi, Deputy Director, Office for the Promotion of International Exchange, and Ms.Mitsuko Inokuchi, Head, International Student Exchange, Kobe University, paid a visit to the Faculty on September 21, 2009. On this occasion they were cordially received by Associate Professor Surapeepan Chatraporn and Assistan Professor Dr. Chomnard Setisarn, Deputy Dean for Planning and Development. In the course of warm and productive discussions, proposals were raised to explore the possibility of formal academic and cultural cooperation between Kobe University and Chulalongkorn University. Deputy Dean for International affairs, on July 16, 2009 to discuss further academic cooperation and student exchange which will hopefully be implemented in the next academic year in accordance with our ongoing partnership. 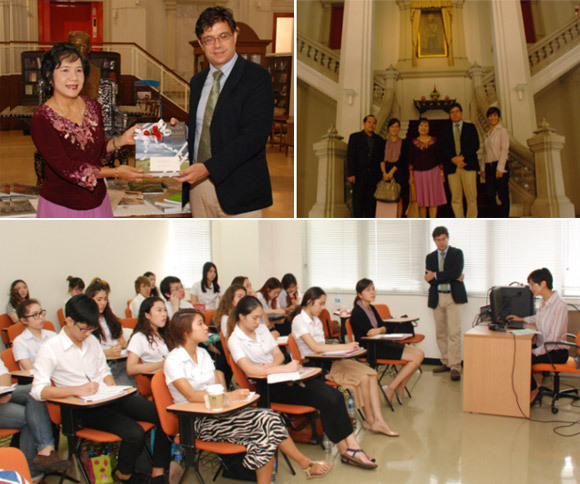 On June 26, 2009, the Section of International Affairs welcomed students, faculty and general Europhiles to “A Friday Morning Talk by the German Ambassador” in Room 105, Maha Chulalongkorn Building from 10.00 to 12.00. Upon his arrival, His Excellency Dr. Hanns Schumacher was warmly received by Dean, Asst. Prof. Dr. Prapot Assavavirulhakarn, Deputy Dean for International Affairs, Assoc. 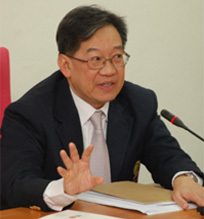 Prof. Surapeepan Chatraporn, Head of the German Section, Assoc. Prof. Dr. Wanna Saeng Aramroeng, and Prof. Thanomnuan O-Charoen, Director of the Chalermprakiat Center of Translation and Interpretation, who together took His Excellency on a cultural tour of the historic building. After an introduction by able Ajarns Dr. Mattanee Palungtepin (MC) and Claudio Kasperl (moderator), Dr. Schumacher’s fact-filled yet lively lecture on “Germany and the European Union: 20 Years after the Fall of the Berlin Wall” prompted many questions from both students and teachers and lead to a stimulating discussion—to the great delight of His Excellency, who had earlier on encouraged the students to participate by saying “There are no silly questions. There are only silly answers!” While he was certainly proven right by the intelligent enquiries from the audience, his replies, though deliberately informal, were far from “silly” and provided unique insights into the workings of the German state by an absolute insider. After the lecture, a luncheon was hosted in honor of the German Ambassador by the Dean at Plaza Athenee Hotel. The “Friday Morning Talk by the German Ambassador” was another success, with enthusiastic participation by an audience of approximately 100. The Committee of the Section of International Affairs wishes to thank the professors from the German Section whose close collaboration and assistance were very much appreciated. steps of the professional dancers left the audience mesmerized and charmed. 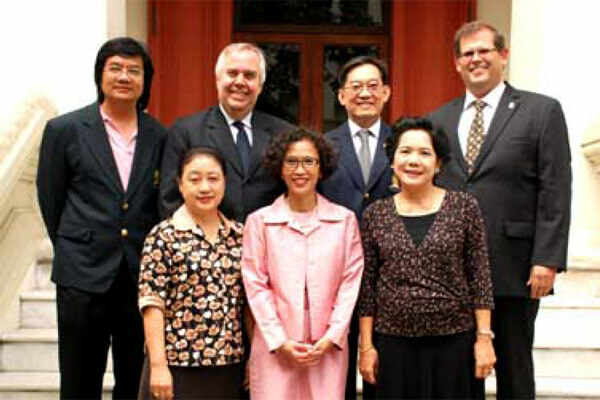 On June 26, 2009, the Section of International Affairs welcomed students, faculty and general Europhiles to “A Friday Morning Talk by the German Ambassador” in Room 105, Maha Chulalongkorn Building from 10.00 to 12.00. The “Friday Morning Talk by the German Ambassador” was another success, with enthusiastic participation by an audience of approximately 100. The Committee of the Section of International Affairs wishes to thank the professors from the German Section whose close collaboration and assistance were very much appreciated.